The mission of the Thomas County Middle School Library Media Center is to provide students, faculty, and staff with the essential resources to proficiently access and utilize ideas and information and to create life-long learners who are critical thinkers, problem solvers, and effective users of technology. The Thomas County School System wants students to READ this summer! Did you know that students can have up to a 2-3 month loss in reading ability over the summer? It's important for students to spend time sharpening their reading skills! We have eBooks available for checkout through our media center. You can also visit gofollett.com to access our catalog and eBook collection. See what we have in our collection! 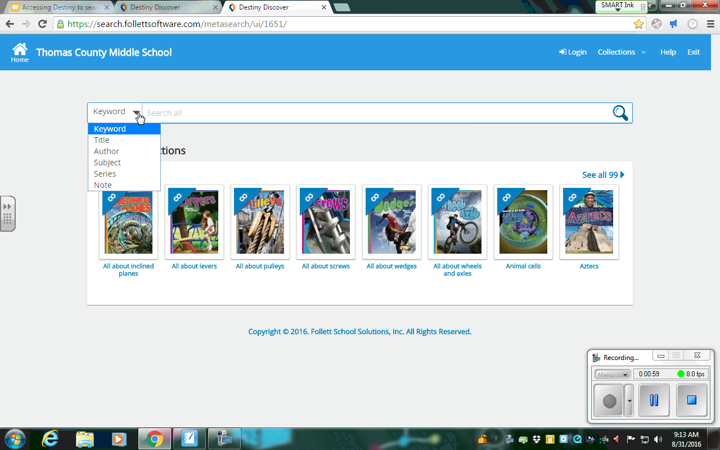 Watch the short video below to learn how to find books in your Lexile range using Destiny. Galileo : Please see Mrs. Craven or your Language Arts teacher for the current password! Click here to read our school's Acceptable Use Policy for the Internet. Please see Mrs. Craven in the media center if you are interested in being a part of the TCMS Reading Bowl team! National History Day Research Brochure - Click here to discover more information about conducting research using GALILEO, Destiny (Web Path Express), and Google.